Cotton Bowl, here we come! The plan was to leave for Dallas at 9:00am sharp. But a road trip that is only 5 hours long is kinda hard to get motivated for. To our credit, by 8:45, everybody in the house was up. It did not take long to load the car, and we scarfed down our breakfast of biscuits. At 9:40, we were all loaded and backing out of the driveway. I sent a text to my friend David, who we are visiting later today and let him know we were pulling out. He replied that we were “almost right on time”. As a father of 3, he obviously knows the drill. Before we even got a mile down the road, one the kids asked, “Are we there yet?”. HA HA, kids. Now, if I hear that one more time, we’re going to have one less passenger in the car. By the time we reached Atoka, several hours into our drive, we had our first full-fledged crisis. The stylus for the Nintendo DS was missing!! We pulled over for a pit stop and turned the van upside down, but we could not find it. Maybe later. Any time we go to Dallas, one of our highlights is stopping at The Peanut Shoppe in Durant. We spent about 15 minutes and $25 in there and then hopped back on the road. Another staple of a trip to Texas is the chance to eat at Jack in the Box. This is something we can’t do at home, at least for short while, since they are building a Jack in the Box in Broken Arrow right now. We stopped in Dennison, which was the first Jack we found. 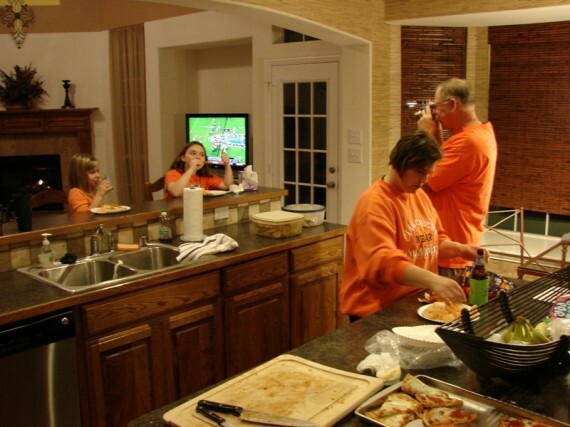 While there, another carload of Cowboy fans came in, and one of the kids in the group had gone to Mother’s Day Out with Marissa. You never know where you will run into somebody you know. A short drive later, we arrived in Allen to visit our friends, the Holemans. We had only seen them once in the past 6 years. We got to spend almost 3 hours at their house, catching up on everything from what the kids are up to, to how awesome Blu-Ray DVDs are. Much to our surprise, they are thinking about selling their house and moving. They have a beautiful house in a great neighborhood, plus we know how to find it. Why would they move? 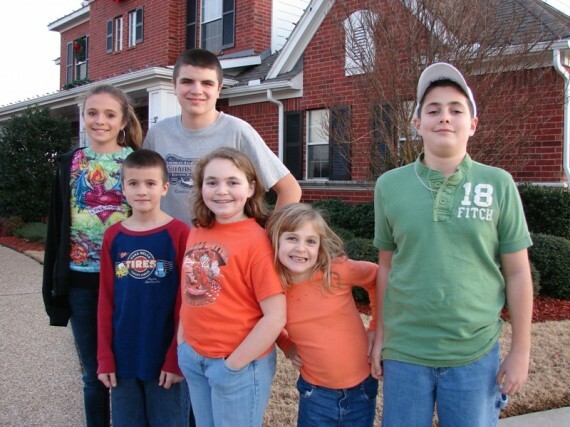 The Holeman and King children. David & Kim’s oldest son is Jacob, and he is 14. He is the first baby that we were ever around, as adults. This affected us to the degree that when Miles was born, we called him “Jacob” inadvertently many times those first few weeks, because obviously that’s what babies were called. The Holemans are going through all the growing pains with kids that we face later. They gave a cell phone to their oldest son with instructions not to text on it since there was no texting plan included. You can guess what happened next. The next bill came in and it was $300 more than what they expected. Now the middle child is the proud owner of that cell phone! 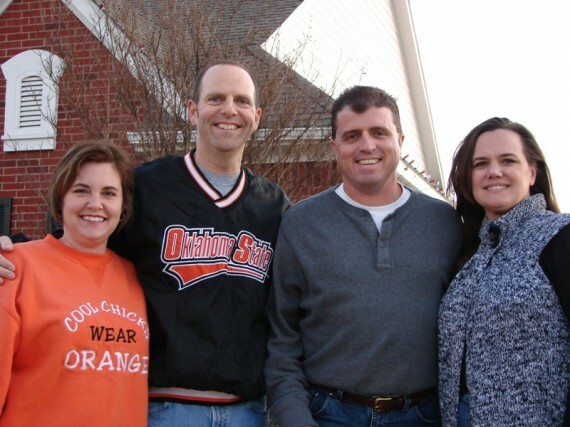 During our trip down, my parents, brother & sister-in-law were traveling down I-35 to meet us in Dallas. They had the most eventful stop of the day, when they pulled into “The Picnic Stop” in southern Oklahoma. This place was part convenience store and part flea market. You could purchase a rubber “skinhead” for $7.99 or a previously-owned men’s suit for $12.99. If you come across this place on your travels, you need to make it a point to stop. 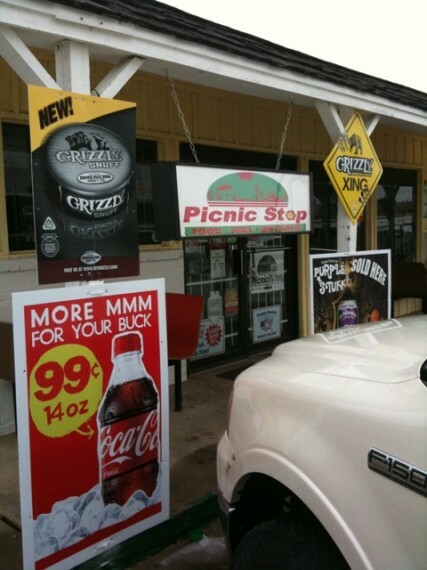 The Picnic Stop on I-35. A must-see attraction! After we left the Holeman house, we made a beeline for our rent house in Mansfield. We took the President George Bush Turnpike to shave some time since it was rush hour. What a great turnpike! This was the only turnpike I have ever driven on that does not have tollbooths. David told us that they take pictures of your license plate and mail you a bill. However, a discussion later with my Dad indicated this may not work so well for out of state drivers. He was on it several months ago and never received a bill. Thank you, Texas! We found our rent house with minimal problems, but we beat the rest of the family, so we took off and found a Super Target to do some grocery shopping. We filled the cart with frozen pizzas, beer and other staples. When we got back to the house, we finally connected with the rest of our traveling party. Hanging out at the Rent House. After dinner, we had birthday cake and ice cream to celebrate Mallory’s 10th birthday, which was yesterday. Mallory was very happy to actually spend her birthday at home this year. 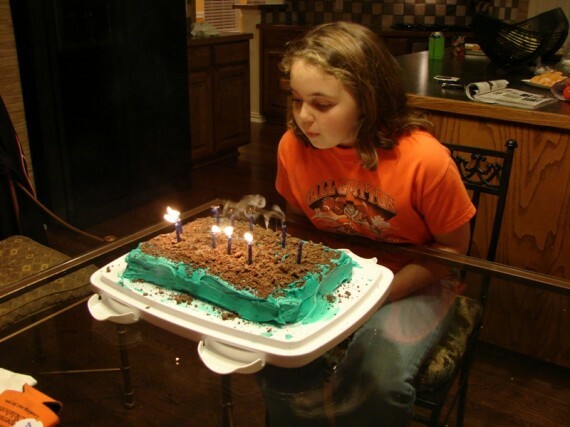 Mallory blowing out her birthday candles. 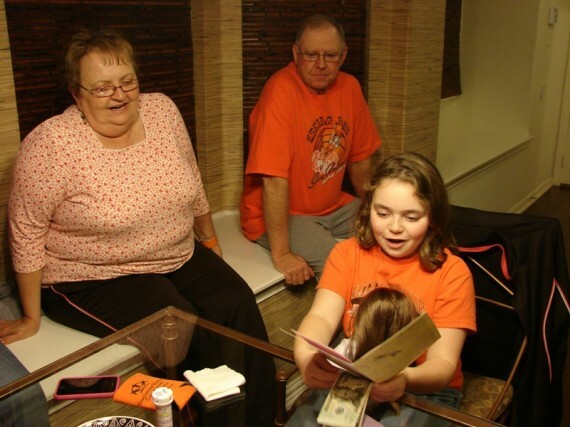 Mallory opens a card while Grandma and Grandpa watch. The house we’re staying at is pretty unusual. The floor plan is interesting (“makes no sense”) but the kids love it. Marissa says over and over, “I like this house”. About 10:00, Dad, Scott & Erin went on a Steak Run. We’re hosting family for a New Years Eve party tomorrow night and we’re providing the meat. Looks like our cousins from Frisco and Dallas will all be able to come over. We’re looking forward to that!